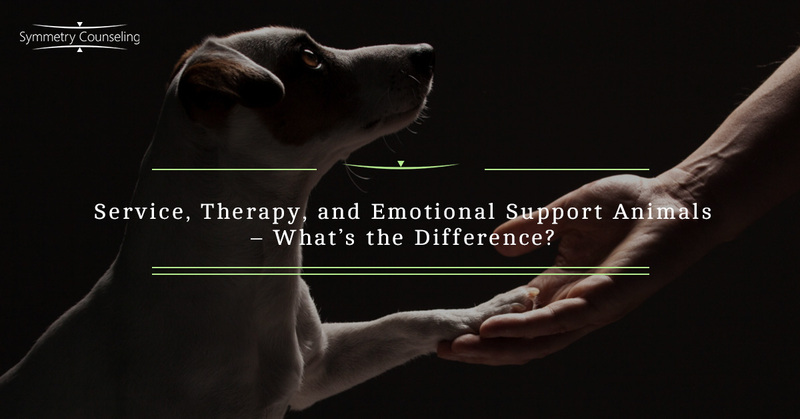 Therapy Chicago: Service, Therapy, and Emotional Support Animals – What’s the Difference? Service, Therapy, and Emotional Support Animals – What’s the Difference? When you see an animal board the cabin of a plane or walk into a public building with a “no pet” policy, you know that this animal is special. They are not your average pet, but what do you call them? Are they a therapy animal, a service animal, or an emotional support animal? These statuses can be confusing, and with an increased number of animals being identified it’s important to know the differences between them. Description: The Americans with Disabilities Act defines a service animal as “any dog that is individually trained to do work or perform tasks for the benefit of an individual with a disability, including a physical, sensory, psychiatric, intellectual, or other mental disability.” Miniature horses have been added as an alternative species in special cases. The tasks performed by these animals must be directly related to the identified handler’s disability. A few examples of such tasks are navigation for a blind or vision impaired individual, assistance when a person experiences a seizure, and alerting individuals to the presence of allergens. Appearance: Service animals wear vests displaying the word “service” to identify them. They are rarely seen in public without their vets. Do not touch service animals without asking their handler, as you might distract the animal and put their handler at risk as a result. Handlers: Service animals are handled by members of the general public who benefit from specific tasks which the animal is trained to provide. Legal: Service animals are able to enter all public places, including those with “no pet” polices, and are able to board planes in the cabin with proper documentation. Description: The American Veterinary Medical Association (AVMA) and the Air Carrier Access Act defines a therapy animal as “a type of animal-assisted intervention in which there is a goal directed intervention in which an animal meeting specific criteria is an integral part of the treatment process.” Therapy animals are found in a variety of settings, such as therapist’s offices, hospitals, and prisons. These animals are of many species and have a temperament that allows them to safely and therapeutically interact with the public. For example, a therapy animal would be able to remain calm when a person is expressing intense anger. They may also comfort someone who is experiencing a panic attack. Some of these animals are specifically trained to work with certain populations. Appearance: Therapy animals sometimes wear vests displaying the word “therapy” or the logo of the organization that they represent. They do not always wear vests. Handlers: Therapy animals are handled by a variety of mental health and medical professionals, including physicians, nurses, and occupational, physical, speech, or recreational therapists. These animals are also handled by members of the public when they are not providing therapy services, as they often double as pets. Legal: Therapy animals are legally considered pets and have all the rights provided to pets, with no special privileges (such as those afforded to service animals). They cannot enter public spaces with “no pet” polices and they cannot board a plane in the cabin. Description: The ACAA and the Fair Housing Act define an emotional support animal as “an animal of any species, the use of which is supported by a qualified physician, psychiatrist or other mental health professional based upon a disability-related need.” These animals are not trained to perform a particular task, so they are not service animals and they do not provide animal assisted therapy services. However, some animals can fulfill multiple service or support roles if they meet the requirements. For example, some dogs may work as both service animals and emotional support animals, and some emotional support animals might volunteer as therapy animals. Appearance: These animals will sometimes wear vests displaying the words “emotional support”, “support”, or “E.S.A” to identify them. They do not always appear in public wearing their vests. Handlers: Emotional support animals are handled by members of the general public – usually their owners – who benefit from the emotional support provided by the animals. These animals can also be handled by members of the public who do not benefit from their emotional support. Legal: Emotional support animals are allowed to live in certain areas where common pets are not allowed to live. They are also allowed to board a plane in the cabin. Owners are often asked to have documentation available when traveling on airlines or applying for housing. They cannot enter public places with “no pet” policies. If you benefit from emotional or other forms of support provided by animals, you may also benefit from counseling. Symmetry Counseling provides individual therapy, couples therapy, and family therapy. Contact Symmetry Counseling at 312-578-9990 to schedule an appointment. Amanda Gregory, LCPC, and Symmetry Counseling do not provide the documentation needed to register service animals or emotional support animals.